How do you develop and run labs on a shoe-string budget? How do you communicate your excitement about science to your students? program completion within four years for most students. View the courses required for the TeachScience major. 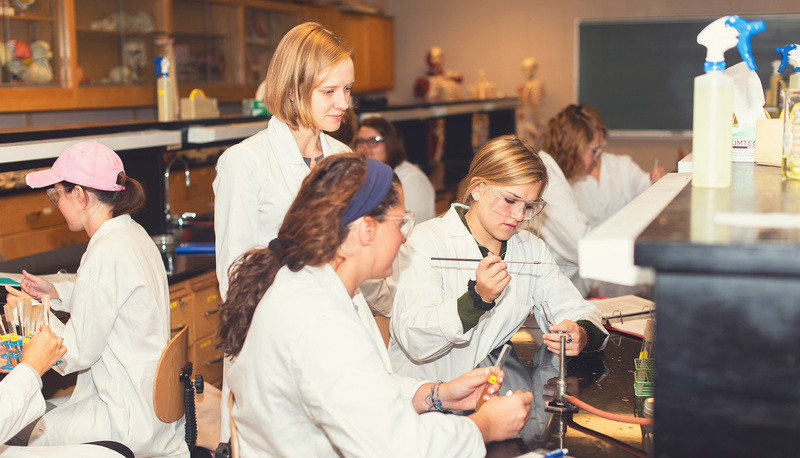 Our students must couple their TeachScience major with a traditional biology, chemistry, or physics major. With a traditional science major, graduates have the option to teach or find other employment using their AU science degree. The TeachScience program at Anderson University will get you ready. Teaching science is an excellent way to impact the world for Christ. Educating future generations of bright people who are problem solvers with a heart for God is a great way to change the world. Graduate in four years. TeachScience students graduate as fully licensed science teachers with a science major in four years. This is unusual. At other colleges, students often complete five years of study and still do not have as extensive a background in science as AU’s TeachScience graduates. Gain experience. Students get experience in the classroom early on to see if teaching is for them. TeachScience students help in the department as paid lab assistants to the AU science faculty and learn firsthand how to run a lab.